Liina Siib visits the 16th international fair of contemporary and historical photography in Paris. November is photography month in Paris. Every two years the cultural institutions and galleries focus on shows of photography, and every year the international galleries, publishers, collectors and curators gather for the photography fair Paris Photo, which for the second year in a row was housed in the magnificent Grand Palais with its glass ceilings and metal construction. Grandness transpired everywhere – in terms of the number of publishers and visitors, the special exhibition programme and the additional Plateforme. Press releases echoed Paris’s wishes to reassert its leading position as the capital of photography. The rich photography tradition in France or the economic side of it cannot be ignored. It is mainly a Western white middle-class event that tries to offer documentary and artistic images of the world, some more, some less. Julien Frydman, the director of Paris Photo has a background in the Magnum and Arles photography festivals. The 16th photography fair was opened by the French minister of culture Aurélie Filippetti, French Prime Minister Jean-Marc Ayrault and the President’s partner Mrs. Valérie Trierweiler also visited the event. The programme for La Plateforme Paris Photo, with its noteworthy performers, was the motivation behind my trip to Paris, the director and moderator of which was Roxana Marcoci, the curator of photography at the Museum of Modern Art in New York, in collaboration with Paul Holdengräber, the director of New York’s Public Library LIVE. Plateforme, which took place with the help of the Luma Foundation, was not an academic event but structured as an experimental platform, which during the four days saw a colourful array of international people – famous artists, architects, theorists, filmmakers and others who exchanged ideas on the relational context in which photography operates today and in turn offered meaning to the main goal of the fair. Plateforme consisted of smaller formats such as critical round-table discussions, pecha kucha sessions, darkroom, interactive and performative lectures which covered a wide spectrum of subjects. In particular, the discussions exploring the Düsseldorf school of photography (including Hilla Becher and Thomas Ruff); architecture, urban photography and propaganda (including Rem Koolhaas, Charlie Koolhaas, Beatriz Colomina, Mark Wigley, Martin Parr) and the filmic element in still and moving pictures (David Lynch) were the three most interesting. The first round-table discussed what constitutes an avant-garde academy and how a school of photography emerges. Düsseldorf Art Academy has seen three generations of photography artists. Hilla Becher talked about how she together with Bernd Becher started in Düsseldorf in the 1960s: first they built a darkroom and a workroom with Bernd, the photography department came later and Bernd was the one who worked officially as a teacher. They mostly worked with black and white. Hilla Becher said, "Colour photography was very expensive so we stuck to black and white." Everything was run on a very low budget, artists among themselves, and no market for photography. It was only retrospectively that they started to call what they did conceptual art. Hilla Becher added, "The only people who did not understand it or did not like it where the photographers." In the beginning Thomas Ruff considered what the Bechers were doing to be boring: "I was in shock when I heard that the Bechers are going to teach me. Later, the concept became like an ideal for me. I realized that they were right and I was wrong." The debate continued with the relationship between photography and painting, their format and precision. The Bechers would not have been able to paint their objects the way they photographed them. Photography resulted in the refinement of detail and the precision of large format cameras. Ruff added that photography was considered second-rate art due to its format; large format enabled it to overcome this limitation. Large high quality pictures could be printed from large format film. Even the collectors were shocked how sharp these were. One exhibition as part of the fair introduced publications from 1964–2012 that were connected with Bernd and Hilla Becher’s work. One hundred photographs from the book "Zeche Zollern II" from 1977 were also exhibited for the first time. Thomas Zander Gallery based in Cologne sold Candida Höfer’s black and white series "Liverpool" from 1968 to a European museum for 290,000 euros – a testament to the continuing success of the Düsseldorf school. Another example is Gallery TAIK which represents the artists of the Helsinki School of Photography, and which was the only representative of Finland at the fair (producer Mirja Majevski, alumna of Estonian Academy or Arts). By taking into account how quickly the photographs on the walls of their booth changed, it appeared that the international collectors had also found them. Photography artist Martin Parr in the architecture and propaganda round-table claimed that most books on architectural photography are propaganda. Beatriz Colomina (Princeton University) admitted that modern architecture is a form of media; the image itself becomes part of architecture. Modern architecture becomes prominent in the media, for example, in newspapers, photographs, books etc. Images are the new architecture and photography makes it modern. The archival round-table viewed (photographic) images as documents, which are being constantly redefined. They touched upon the problem of photographic archives and obtaining and reusing images (artists Adam Broomberg and Oliver Chanarin, Akram Zaatari, and director of Fotomuseum Winterthur, Urs Stahel) by summarising that – there is hope in every archive, but there can also be pain; without hope there is no point in establishing an archive. Two pecha kucha (Japanese for "the sound of conversation", 6 min 40 sec presentations) sessions directed rapid focus on noteworthy exhibitions, events, artist books and phenomena connected with photography. This kind of "performative blog" format is perfectly suited to sharing information and presenting preferences. The discussion topics included the Vatican Observatory, observation and faith (artist Laurent Grasso); from Z to Z or from Zoe Leonard to Zanele Muholi and the South African lesbian soccer team (art critic Elisabeth Lebovici, Paris); room-sized pinhole-camera projects, where the result is a negative image with very long exposures (artist Vera Lutter); practices of presenting photographs in the context of exhibitions according to the peculiarities of different mediums (photography curator Matthew S. Witkovsky, Art Institute of Chicago); Michael Schmidt’s book "Lebensmittel" (Simon Baker, Tate Modern); telling stories and giving meaning in a time that has seen a vast increase in images (artist Alec Soth) and many others. In her interactive lecture Taryn Simon, a photography artist from the USA, presented an overview of her project dealing with a virtual image atlas, which was created in collaboration with a programmer Aaron Swartz. The atlas deals with statistical information and the neutrality of search engines and the changing of images over time. The website shows the first five images that the Google search engine displays in different countries for English terms such as "jealousy", "leader", "artist" etc (www.imageatlas.org). The main attraction at the fair was definitely filmmaker David Lynch, who Julien Frydman had approached before the fair and asked to select his favourite photographs from the fair during a digital blind date (Lynch did not receive any information about who the author was or the names of the works), which in the exhibition were then labelled with black signs "Vu par David Lynch" (99 photographs in total). The second part of the request entailed sequencing the selection for a book published by Steidl. Truth be told, Lynch’s selection was spot on, and could be viewed as scenes from his movies. A parallel, which from time to time touched upon different aesthetic beliefs, also emerged in the booths at the fair. At Plateforme, Lynch in conversation with Paul Holdengräber provided insight into his choices and the words "thrilling" and "organic phenomenon" stood out. Lynch’s admirers can watch the conversation at the Paris Photo website parisphoto.com. Since I lacked the direct desire to obtain a photograph, I did not view the booths through a collector’s eye. I did however look at the prices and there were many red dots on the labels by the fourth day. Both of which present complete parallel realities compared to the circumstances in Estonia. Oddly enough, photographs of homeless people, beggars, the abandoned and the sick in beautiful expensive frames stood out. There were also photographs of the home of an HIV-patient in South Africa. Several galleries offered Irving Penn’s photographs of cigarette butts. It is interesting that many galleries presented the type of work that had been commissioned from the photographers. These professional commissions work very well in the context of the fair – the photographer has already considered the commissioner, perhaps had a larger budget, stylists and a team – something that has been accepted by one person may very well be liked by another. One word among those that were thrown out there and which lingered in the minds of dealers and collectors as a magic formula was precision. Precision as an optical concept and an illusion. This is something that a desirable photograph should be able to offer. Paris Photo also takes place in the Paramount Pictures Studio, Los Angeles, between 26 and 28 April. Liina Siib is an artist who mainly works with photographic images. She represented Estonia at the international Venice art biennale in 2011. Alex Prager. 4:01pm Sun Valley. 2012. Archival pigment print. 153 x 122 cm. 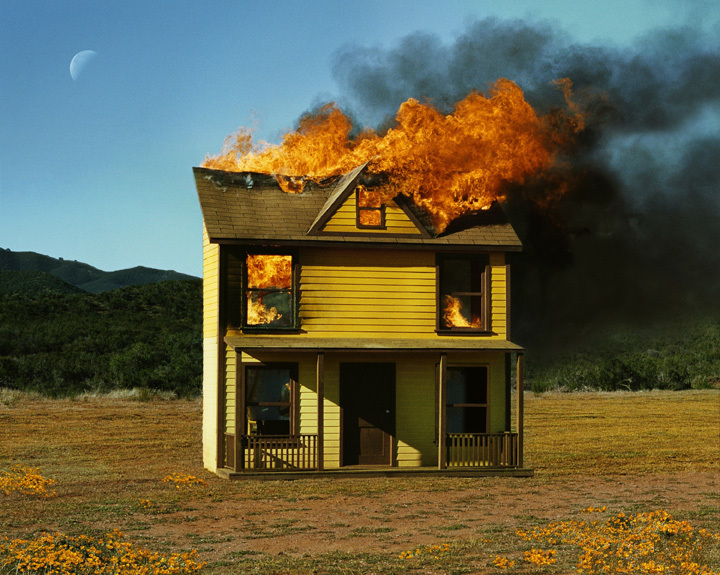 Alex Prager, courtesy of Michael Hoppen Contemporary.